Aren’t spiders wonderful? I mean, when you think about it, they’re fantastically beneficial to the insect ecosystem, keeping other the populations of bugs like mosquitoes and hornets in check. Wouldn’t you like to show a spider your gratitude? Can’t you imagine how nice it would feel to have his eight little legs skitter across your face and up into your hair? Aaaad the odds are good that some of you are squirming at the thought. Because spiders are creepy. 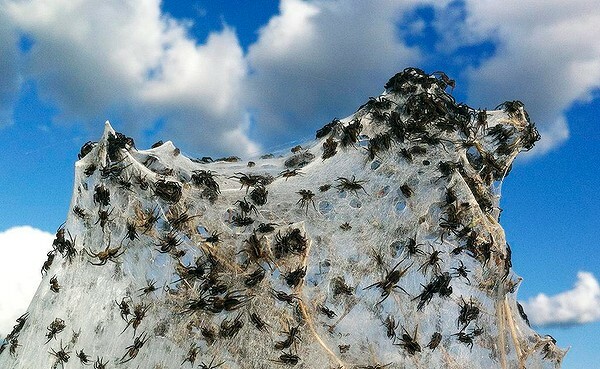 They look creepy, they walk creepy, they build creepy webs…just…eww. Which is why I think they’d make great fodder for flash fiction. But we’re not stopping with just spiders. Oh no my friends, we’re taking it to the next level. Take a look at this will you? No my friends, that is a picture of the morning light glinting off of millions of spiders webs. Millions. I’ve said it before, but it bears repeating. The zombie apocalypse is getting to be old hat. Not that there still aren’t great stories that can be centered around it, but maybe it’s time to begin looking for a new end of the world. An end with eight legs and fangs. I’m stealing this idea from my friend Tony Southcotte who wrote a story on this theme that I had the great pleasure of editing recently. What does the arachnopocolypse look like? Well that’s up to you. Maybe the threat comes from millions of regular-sized spiders that are impervious to all conventional insecticides, and can kill a man with a single bite. Maybe we’re talking giant mutant spiders that catch men in their webs. Or maybe it’s something else entirely. You’ve got a thousand words to tell your tale. Post your story at your blog or other online space and link to it from the comments. So get cracking ya’ll! Submit your spider story and win what I feel confident saying is at least the second-best story to feature a killer compost heap ever. This entry was posted in Challenges and tagged Albert Berg, Arachnopocolypse, Flash Fiction Challenge, The Mulch Pile. Bookmark the permalink. Oh crap. OH CRAP! Now, see. I kinda like spiders. Kinda. As long as they don’t touch me. I like daddy longlegs and pretty garden spiders. I like jumping spiders (as long as they don’t jump on me). I love they way they eat bugs…except, why don’t they catch the cat sized roaches that scuttle around the compost heap? 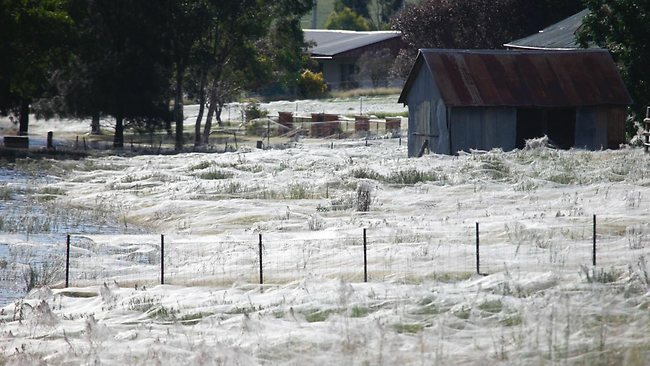 But the pic of those webs….I think I’ll be shuddering for a month now. There’s nothing I like about spiders, no matter how beneficial they are. It is a fear rooted in idiocy, I know, but it is a fear nonetheless that I have been unable or unwilling to overcome. I love spiders, and spiders love (to bite) me. I’m on it. Is there a deadline? I repeat, if you are reading this IN THE FUTURE there’s no cut-off date. If its 2053 and you don’t see ten stories here then you’ve still got a shot. Assuming I’m still alive and stuff. I already have a copy of 1 of the top 2 best ever killer compost heap stories, so I’ll take my time. 🙂 Or maybe I’ll send my story before you announce the challenge (time machines are fun.) Wow, now I’m thinking of all kinds of ways my arachnopocalypse tale can mess with the spiderwebby fabric of the space-time continuum! You’ve made some good points there. I looked on the web for additional information about the issue and found most individuals will go along with your views on this site. webpage; this webpage carries amazing and truly good information in support of visitors. This game shares improved and superior rules and hand ratings (not always). a minimal limit poker tournament may be a good way to start practicing how to use them.